In reelecting Davis, the voters rejected challenger and current commissioner Chuck Horton, one of Davis’ strongest critics, but voters gave strong support to incumbent commissioner Jim Luke, who has been even more outspoken of late in his criticism of Davis. Voters ignored yard signs, billboards, and other extensive advertising and reelected Sheriff Scott Berry for a sixth term, but they turned out the vice chairman of the Board of Education, who was seeking the chairmanship, in favor of someone not even on the Board. Oconee County voters also strongly supported attorney Doug McKillip over challenger Regina Quick, even though McKillip had been a party to splitting the county’s legislative district, against the recommendation of Davis, among others. Quick won because of support in neighboring Clarke County. Overall on Tuesday Oconee County voters were not very sympathetic to female candidates and were more supportive of the status quo than change. But an analysis of the voting results, with particular focus on patterns across elections across the county’s 13 precincts, indicates there were few such patterns. Turnout was high, and the evidence is that voters made decisions on the various contests based on the particular circumstances of the races themselves. All contested races were on the Republican ballot, which most voters chose. Davis carried 10 of the county’s 13 precincts and defeated Horton by 744 votes, according to the most recent data available from the Georgia Secretary of State Election Division. Four years ago, Davis carried only six of those 13 precincts, defeating challenger Sarah Bell by only 100 votes. In actual election day voting, in fact, Davis had only six votes more than Bell, having built up his slight majority in advance and absentee voting. On Tuesday, Davis got 54.4 percent of the election day voting, and 53.8 percent of the advance and absentee votes cast. Turnout was high on Tuesday. Overall, 9,883, or 45.7 percent of the 21,632 active voters, cast a ballot, and 8,968 cast votes in the Davis-Horton race. Only 6,150 voted in the 2008 Bell-Davis race, when overall turnout was 36.4 percent. In 2004, in Davis’ first race after his initial election to the chairmanship in 2000, he got 63.4 percent of the 5,180 votes cast. Turnout that year was 40.3 percent. Davis’ opponent in that 2004 race was John Daniell, now serving as Post 2 commissioner. On Tuesday, Davis, 72-years-old this year, did not carry the Annex district, which includes much of Watkinsville and is the home district of Horton. Davis also didn’t carry City Hall, which also includes Watkinsville, or Farmington, in the far south of the county and the county’s smallest precinct in terms of number of registered voters. In 2008, Davis also lost those precincts, but he also was beaten badly in Antioch, another far south and mostly rural precinct, in Dark Corner and Bogart, in the far northwest of the county, and in Civic Center, in the geographic center of the county. An analysis I did of the pattern of votes in the 13 county precincts after that election suggested an anti-development sentiment explained some of the voting against Davis. Rapid development is not an issue at present, and Bogart and Dark Corner are parts of the county that most likely will get a boost from the decision of Caterpillar to locate its plant just east of Bogart on the Oconee and Clarke county line. Davis, a strong proponent of development during his time on the Commission, played a leadership role in the Caterpillar announcements. Luke, who has become particularly outspoke about Davis’ go-it-alone versus partnership strategy with other members of the Commission, carried all 13 of the county’s precincts, including Davis’ home precinct of Colham Ferry. Overall, he got 65.7 percent of the vote. Only in Colham Ferry did Luke fail to get more than 60 percent of the vote in his race with Bell, who, of course, also cannot be considered to be a Davis supporter. Bell, however, did not make her opposition to Davis or his style of leadership a key part of her campaign this year. Luke is from Malcom Bridge precinct, while Bell lives in Athens Academy precinct. Mark Saxon also won handily in his race with Tammy Gilland for the Post 4 position that opened up when Horton decided to challenge Davis for the chairmanship. Saxon carried 12 of the 13 precincts, the exception being the very large Athens Academy precinct. Overall, he got 59.1 percent of the vote. Saxon, from an old Oconee family, lives in the North Oconee precinct, while Gilland lives in High Shoals precinct. Gilland had challenged Margaret Hale for Post 3 in the 2010 election, when 29.8 percent of the voters turned out. Gilland got 48.2 percent of the vote in that race, or about 8 percentage points more than she got in the race with Saxon. Sheriff Scott Berry also carried all 13 of Oconee County’s precincts in his race against Trey Downs. He did best in the Athens Academy precinct, his home precinct, where he got more than 75 percent of the vote. His overall figure was 66.5 percent. Downs is from High Shoals precinct in the western part of the county. Tom Odum, a former school principal, carried eight of the 13 precincts in the race for the chairmanship of the Board of Education. He ended up with 54.2 percent of the vote against Mike Hunter, currently Post 4 commissioner and vice chairman of the Board. Odum did particularly well in the large Malcom Bridge and Athens Academy precincts. He lives in the Malcom Bridge precinct, while Hunter lives in the Bishop precinct, which he carried handily. Jennifer Riddle got 74.5 percent of the vote in her contest to replace retiring Tax Commissioner Harriette Browning. Riddle is currently deputy tax commissioner, and she carried every precinct easily. She lives in the Annex precinct. Pamela Lohr Hendrix, who ran against Riddle, lives in the City Hall precinct. Using data from the Secretary of State database on the election, I treated each of the county’s 13 precincts as a unit. That database reports early and election day voting, in each case broken down by precinct. I combined the separate reports to create total votes by precinct. I then looked at patterns across the 13 precincts for each of the contested races to see which candidates performed most like others. I included the T-SPLOST vote figures as well. I also included the data from 2008 for Davis. Here I had to use only the election day voting data, since the early data are not allocated by precinct on the Secretary of State database for that year. I could not include the 2004 race for Davis because precincts were reconfigured after that race. Davis’ 2012 performance is most like that of Odum for the Board of Education, meaning each generally did best and worst in the same precincts. The match is far from perfect, but it is striking that the pattern for Davis is unlike that of other candidates. The next closest match is with Davis’ 2008 race, meaning even though he did less well in 2012, he ran better in the same places as he ran well in 2008. Vote on T-SPLOST is unrelated to vote for Davis, its strong supporter and one of the key figures in putting together the list of projects to be funded if the 1 percent tax had been approved. The pattern of support for Luke is unlike that of any other candidate or vote for T-SPLOST. The pattern of support for Saxon closely matches the pattern of support for Sheriff Berry, but in the opposite way. Where Saxon did well, Berry did less well. Saxon’s support also was high where vote against T-SPLOST was strong, and his support matches somewhat that of Riddle. Berry did best where T-SPLOST enjoyed its most support. His support across the precincts also mirrors that of Saxon, as noted, though negatively, and Riddle, again negatively. Berry’s support looks a bit like that of Odom. Odom’s support is most like that of Davis and Berry and most unlike that of Riddle. Riddle did well where T-SPLOST had its least support. Her pattern of support is the mirror opposite of that of Berry and Odum and like that of Saxon. The data are from the level of the precinct, but they suggest that individual voters mostly were making decisions on the candidates separately as they cast their ballots. 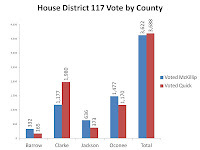 Only in the 117th House District did a woman defeat a male candidate on Tuesday, and that was because of the vote of neighboring Clarke County, not because of the decisions made by Oconee County voters. When the legislature created the 117th House District during the 2011 redistricting session, it did so based on the 2010 Census. 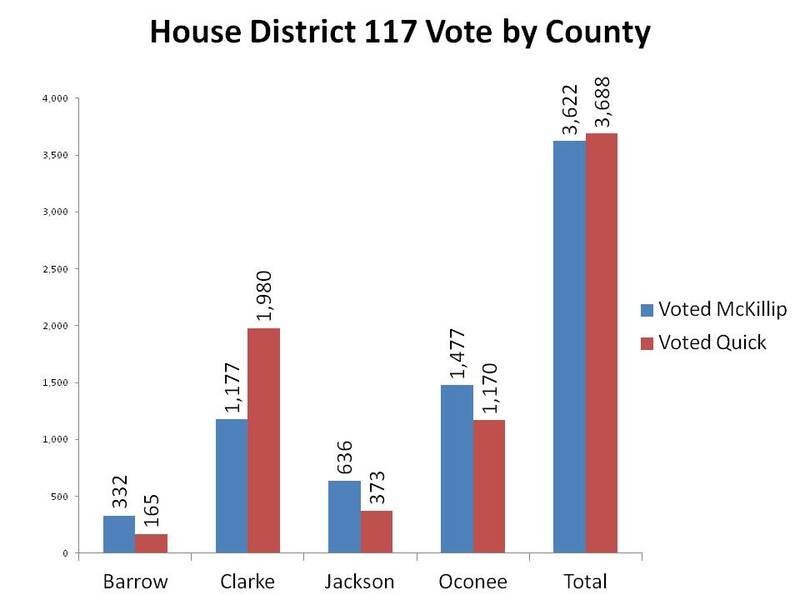 Oconee County was a minority party with neighboring Clarke, Barrow and Jackson counties. Oconee County contributed 19.0 percent of the residents. The district that formed the nucleus of the new 117th had been entirely in Clarke County and was represented by McKillip, who was involved in the redistricting process. McKillip switched from the Democratic Party to the Republican Party after the 2010 election, and the new district, which included the three Oconee County precincts of Bogart, Malcom Bridge and Athens Academy, was much more Republican than his old Clarke County district. According to the Secretary of State data released from the Tuesday election, Oconee County going into the election made up 20.6 percent of the registered voters in district. 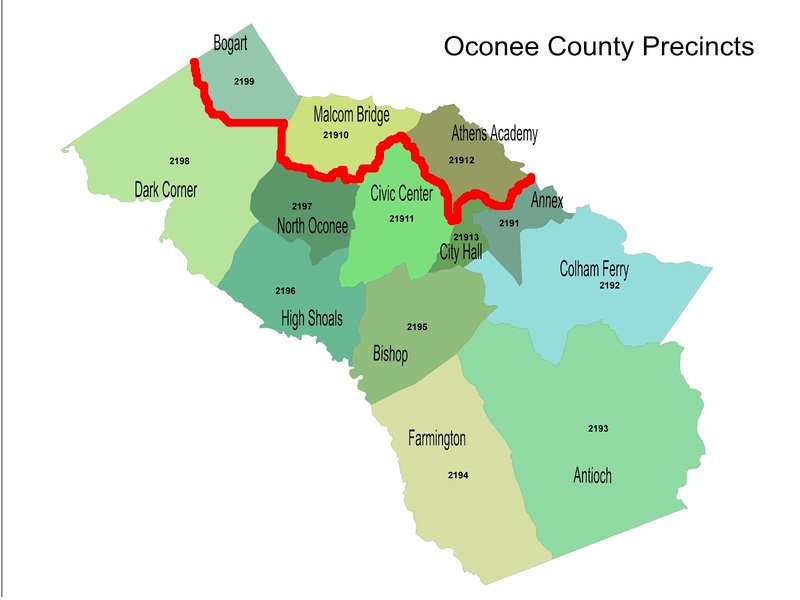 Oconee County generally has high registration rates. And on Tuesday, because of its high turnout rate, Oconee County actually contributed 36.2 percent of the votes cast. Most of those votes were for McKillip, and Quick would have won the election easily had Oconee County’s turnout rate been lower. In the end, she had 66 more votes than McKillip, according to the still unofficial results from the Secretary of State database. Quick did best among the three Oconee precincts in Athens Academy, where she got 48.5 percent of the vote. In Malcom Bridge she got 44.2 percent of the vote. In Bogart, she got only 38.4 percent. In election day voting in Athens Academy, Quick got only one vote less than did McKillip. 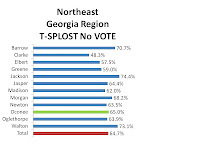 T-SPLOST did poorly in all of Oconee County, but it actually had its greatest support in Athens Academy precinct, where only 56.3 percent of those casting ballots voted against it. In the county at large, the figure was 65.0 percent. Oconee County’s opposition was just slightly higher than for the 12-county district as a whole. That figure was 64.7 percent. Opposition was greatest in Jackson County, where 74.4 percent of the voters said no, and least in Clarke County, the only county in the 12 to give majority approval to the tax, with 51.7 percent approving. In Jackson County, voters also tossed out the chairman of its Board of Commissioners, Hunter Bicknell. He got only 43.9 percent of the vote in a race with Tom Crow. Bicknell had been chairman of the executive committee of the regional roundtable that put the T-SPLOST project list together for Northeast Georgia. Oconee County BOC Chairman Davis was one of the other four members of that executive committee. 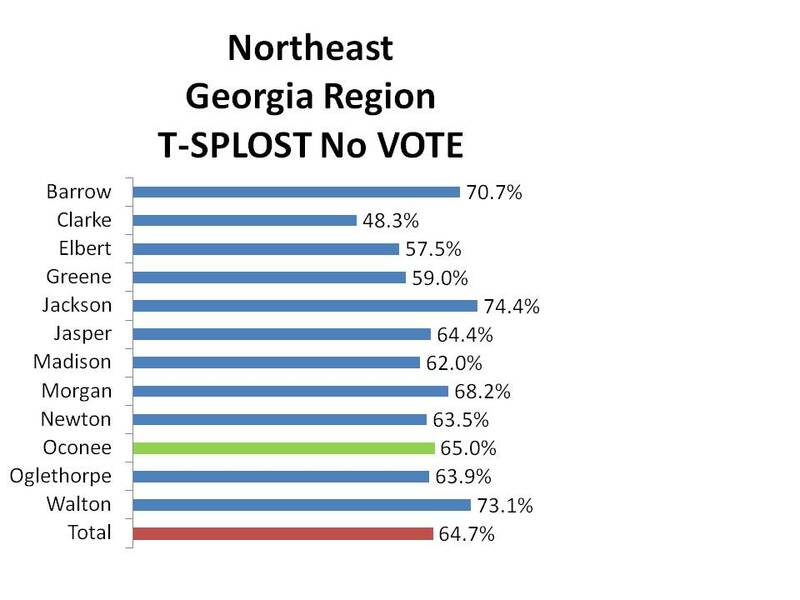 Oconee County voters, who disliked T-SPLOST a bit less than did voters in Jackson County, did not hold T-SPLOST against Davis, or at least not enough to toss him out of office for it. DOUBLE CLICK ON THE CHARTS ABOVE TO ENLARGE THEM.